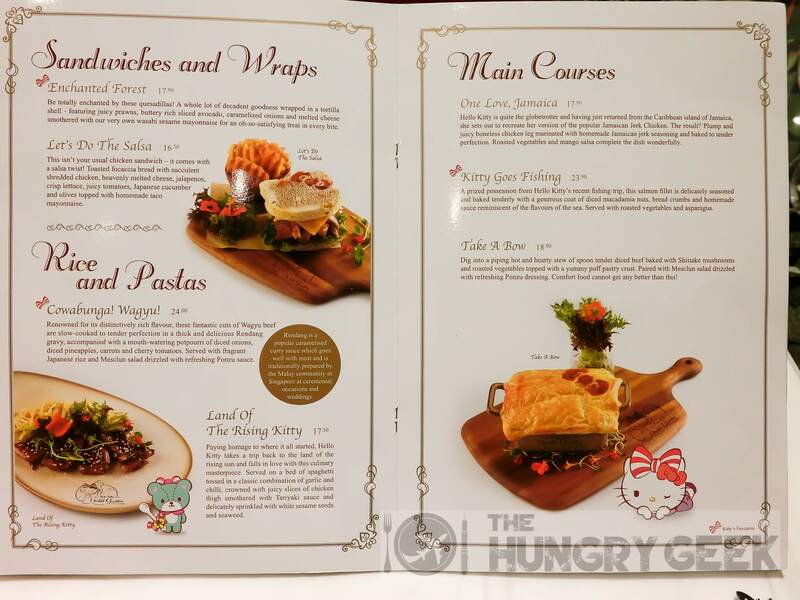 The very first Hello Kitty Cafe has finally arrived in Singapore! Even though I don’t consider myself a huge fan of this cute mouth-less kitty but *hooray* to all the fellow Kitty fans!!! 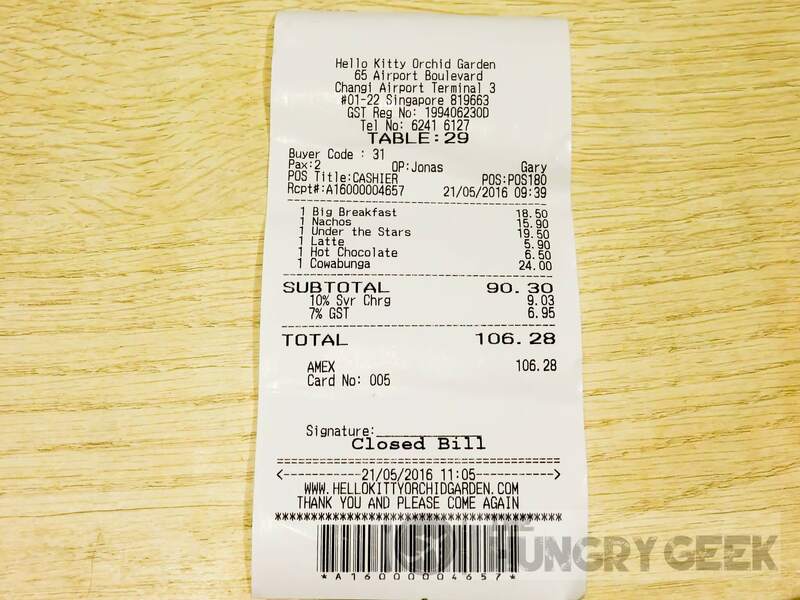 The highly anticipated cafe, namely Hello Kitty Orchid Garden is nicely located at Changi Airport Terminal 3. The good news is, it is the world’s first Hello Kitty Cafe that is open 24/7! Located at the airport, travelers who are catching flights during wee hours will be able to visit too. 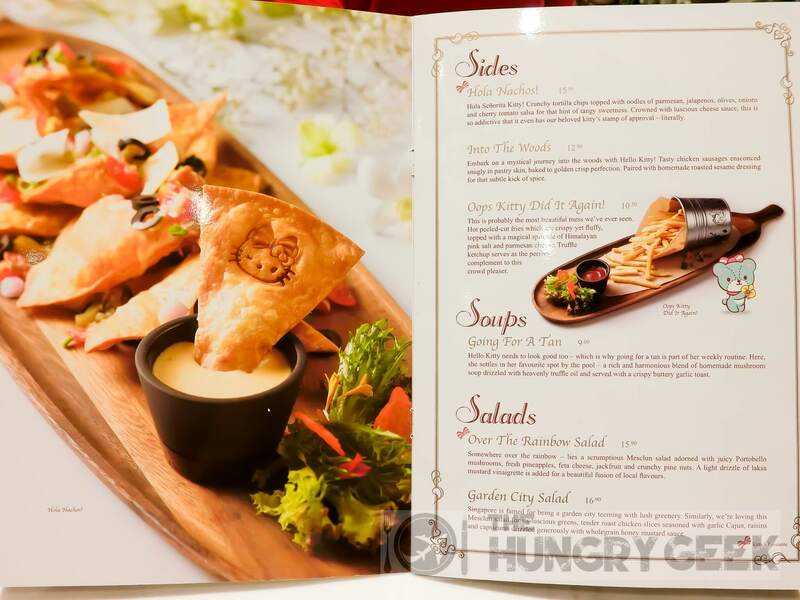 Some locally inspired dishes can be found in the menu and the cafe is also planning to apply for Halal certification. That means, this might be the first Halal certified Hello Kitty Cafe in the world! So people come to Hello Kitty Cafe for the OMG food cuteness and instagram goodness. The food here isn’t the main draw and as such, we won’t be giving food ratings for the first time ever. Just don’t expect super delicious food and enjoy the cuteness overload. The Hello Kitty Cafe is well decorated with Orchid flowers, so much that you really feel like you’re in a garden! As for their service, they did leave empty tables around while there was a long queue, so minus points there. When we were there the dessert side of their kitchen was overloaded, so we had to wait quite a long while for our dessert. The food here is pretty pricey as well, so prepare your wallet! This is one my favorite dishes of the day and it is one of the recommended sides from the menu. The crunchy tortilla chips are topped with parmesan, olives, onions, jalapenos, cherry tomato salsa and generous amount of cheese sauce. The chips with cheese are perfect match with a hint of tangy sweetness from the cherry tomato salsa. You can get this at S$15.90. Aww… The Hello Kitty waffle! The cute kitty waffle is served with creamy scrambled eggs, smoked duck slices and Shitake mushrooms. The scrambled eggs and mushrooms could have done with a tad more seasoning. While the waffle that was topped with cheese and homemade honey lime maple syrup was decent, it could have been a bit crispier. This will set you back S$18.50. This is one of the local dishes that you can find on the menu, the beef rendang with rice! I’m a huge fan of rendang and I have eaten a lot of good rendang dishes over the years. 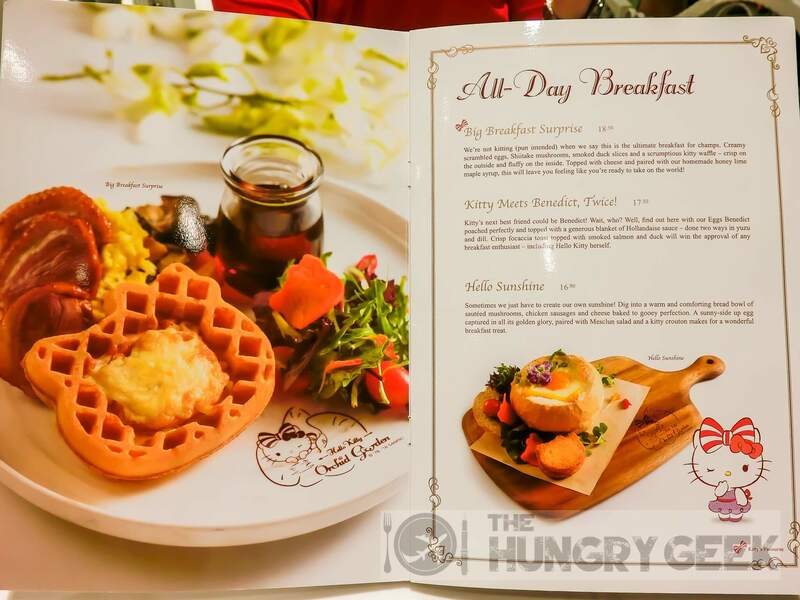 Before visiting the Hello Kitty Cafe, I have read some positive reviews online about this particular dish. Unfortunately the taste didn’t really agree with me. But the Hello Kitty-shaped carrots and rice are just adorable! This goes for S$24. Do I need to mention how delicate the dessert is? Our dessert choice was pretty much decided based on the presentation. Yes, only for the looks. After a 30 mins wait for the dessert, my temper immediately simmered down when it was served. Camping Under The Stars perfectly illustrated the Kitty camping trip in a plate! A tent made out of graham crackers and scoops of yummy hazelnut and chocolate gelato, decorated with a spread of matcha powder as the green field. Not forgetting the bonfire of toasted muesli and the juicy berries surrounding the tent. Is it worthwhile to pay S$19.50 for the cuteness? Your call. There are two life-sized 3D Hello Kitty models for the patrons to pose for photos. Only here in Singapore, the Hello Kitty mascot has two bows on its head. For the Hello Kitty fans, needless to say, this is a MUST GO! The convenient location at Changi Airport has made it easily accessible for fans travelling from other countries. 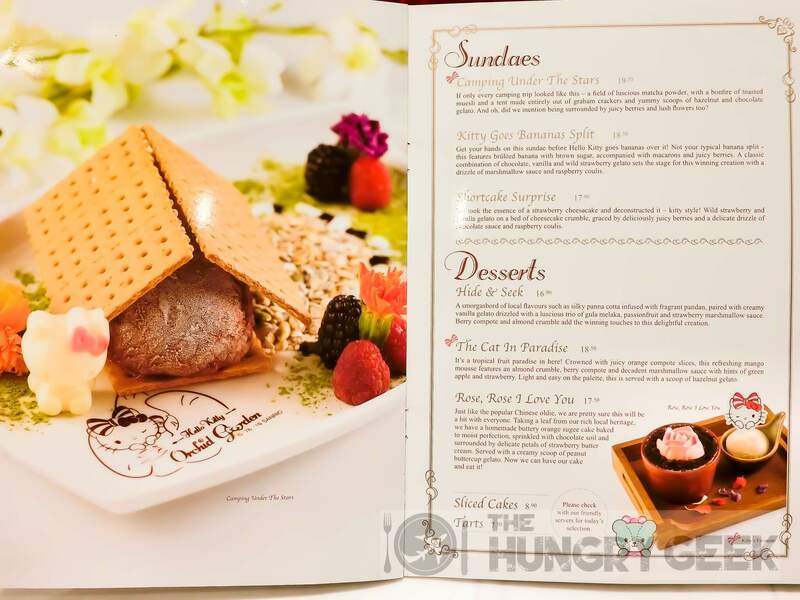 Even if you’re not a huge fan, the Hello Kitty Cafe is definitely worth at least one visit. For the sake of the cuteness, one should really not pin too much hope on how the food tastes here. 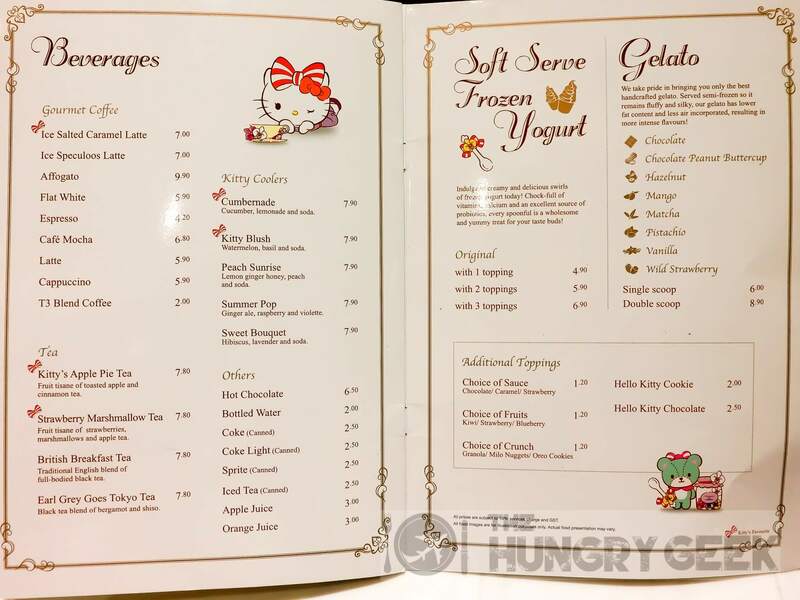 As you can tell from the photos, the Hello Kitty visage can be seen everywhere in the food and from the decorations of the cafe. It is good to know that the themed cafe is not just all in pink and ribbons. With the orchid garden concept infusion, it is really a great place for family and couples to dine in. The Hello Kitty Cafe is definitely Instagram-worthy. So be sure to clear up some memory space for all the photos that you are absolutely obligated to take. All-day Breakfast, Sundaes, Desserts… Everything with Kitty face!